See all the beads available now in the Super Deals! category. Includes a variety of sizes and colors from the entire TLS line of beads. This is a SUPER VALUE!! Limited supplies. Save 50%! This bead is a UV Bead. This bead is the same color as our 7mm "Steelie" Pink bead that is among our most popular bead. A great bead for bead fishing Steelhead as well as for use on spinners. Great steelhead bead. UV Bead. 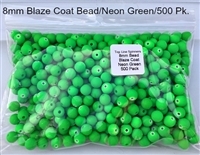 UV Bead/Pack contains all six custom TLS two-tone colors. This bead is made from a UV material that lights up great under UV light. Medium pink with a slight milky appearance. 2mm hole. A great steelhead bead color. 6mm Round Bead/1000 Bulk Pack. Save 25% buying in bulk. Please Note: Limited supplies of 1000pk in this beads are available. The most popular color and size bead in the TLS bead line up. The "washout" pink bead has become very popular among bead fisherman. Particularly for trout. This is aslo a great bead for use on 3.5 colorado spinners.